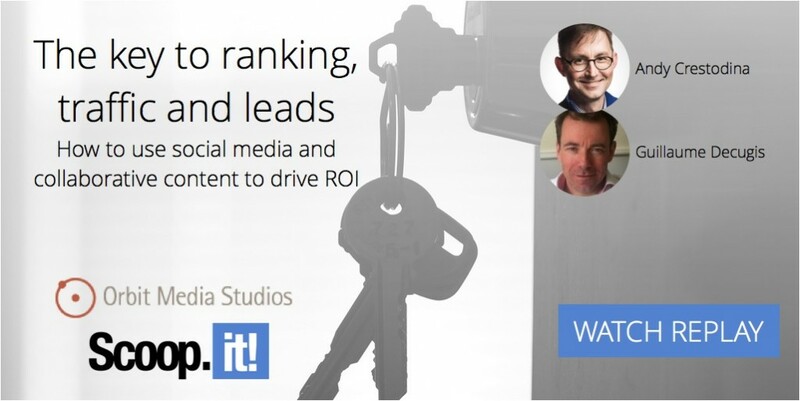 How does content marketing generate leads? In the first few years of content marketing, there wasn’t much clarity on the answer to this question. ROI-driven marketers didn’t have any other measurement system other than Google Analytics, which is hard to configure correctly for content marketing analytics. Some marketers gave up and argued content success shouldn’t be measured by leads generated. Others concluded that content doesn’t work for leads. Content crafters coming from a creative or media background spontaneously focused on other objectives: consumption metrics such as time on page or page views, the type media outlets focus on. To this day, very few marketers managed to build a measurement model and a comprehensive methodology to generate leads as predictably as possible from content. Among them, Andy Crestodina is probably the best you can learn from which we were honored to have him as our guest on the Scoop.it webinar last week. If you don’t know Andy, you should check out his work on the OrbitMedia blog as it’s a gold mine of educational and pragmatic information. Andy was the keynote speaker at Content Marketing World this year, an honor you earn by being the highest-rated speaker from the previous year – which tells a lot given the quality of the conference. And watching him talk a few times, I can definitely attest that he’s brilliant at making complex topics look simple. He’s been a great inspiration to many improvements or experiments we made ourselves with our own content – and even to some product features for Scoop.it Content Director. How to create content that generates leads. Why and how you should involve “allies in promotion” that will help you distribute content. How to optimize for search but also for social to generate traffic to your content. Awareness vs action: how to structure your website to pursue both objectives. How to optimize your content for conversions. There is no magic in what Andy presents. It doesn’t rely on your content becoming viral through an act of God nor does it assume unearthly creative skills. And that’s precisely why it’s powerful. Because any strategy that relies on being lucky or recruiting a Pulitzer prize winner in your content marketing team is doomed to fail. It doesn’t mean it’s easy. As Einstein said, “genius is 1% talent and 99% hard work”. The methodology Andy describes involves many different steps and various skills. But going through it, you will see why it reliably and predictably works. When mapping the above steps to the skills that are required, it’s clear that content is not about doing just one thing well. Creativity is required and probably is the trait that is the most looked for in a content marketer. Yet, it won’t be enough to generate ROI. Analytical skills will be needed for success as well as the ability to develop relationships with people in your industry who can contribute to your content and become your allies when it comes to distribution. Creativity, friendliness, analytical skills… Some lucky few have them all but it’s rare. So do you have a team that brings all these qualities to the game? Are you looking to recruit a unicorn who has them all? Try the assess the quality of the team you can build and supplement with freelance resources that won’t break your budget. For instance, if you have a strong data-driven marketing team that has proven its analytical skills on performance-based paid acquisition programs, maybe recruit a creative freelance writer that built a network and a personal brand in your industry. Or if you have strong creative skills in house, get a CRO consultant to help you understand content performance. Regardless of your industry and size, chances are you’ll have competition for your content: if not from your direct competitors, from media outlets or blogs that try to get attention from the same target audience. We only have 24 hours a day and attention doesn’t grow while the amount of content produced certainly does. To mitigate this bad news, you have to spend time researching content topics. Finding out what others have published on that topic is the only way to be relevant, original or impacting. In short, curation informs creation. And yet it’s probably underused. But as Andy explains quoting Lee Odden, content ranks and performs when it’s the best answer. So what better way to be the best answer than being the first? Producing original research on a topic the internet doesn’t cover yet – or doesn’t cover well – can take time but boy does it work. Andy practices what he preaches and his blogging survey is a great piece of research he publishes every year. Here’s this year’s version. We’ve experienced that ourselves as our content derived from original research always performed in the top tier. We did that by doing surveys as Andy recommends but also by sharing our own data on experiments we ran or results we had from our own content operations. There’s much more in Andy’s deck and presentation so I strongly encourage you to check out his slides and listen to the webinar recording (which also includes a Q&A session). I’ll guarantee you’ll find at least one thing you’ll want to try out or do differently for your content marketing strategy. 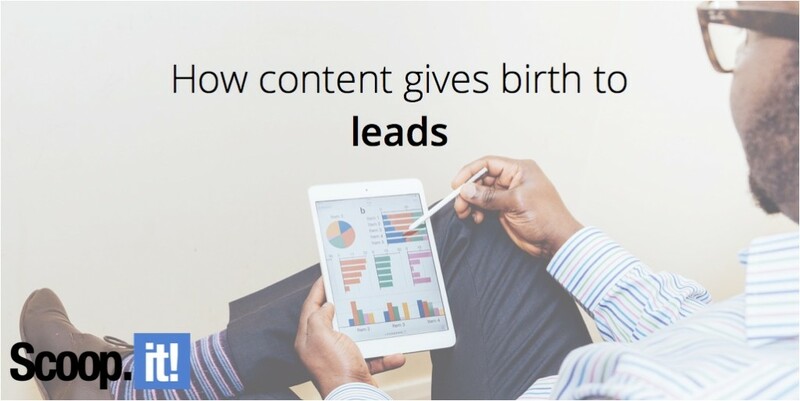 7 Comments on "How content gives birth to leads"
I saw that you used one my of my images in this post. Would if be possible to get my blog(https://paintimpact.com/) Featured instead of my Flickr? Thanks for reporting. And fixed! Really great and useful article! Thank you Guillaume. Can we talk that content gives new leads only if we are talking in terms of a blog selling product or services? The thing is that our company provide software development and it is difficult to make the content to convert even if it is really cool. Thanks for the comment and praise! I’d actually disagree 🙂 Take our case for instance: besides our freemium service, we sell content marketing software which is probably as complex a decision as software development because in both case, this is about changing the way your work, right? Well, most of our leads come from our content. So I’d love to know more about your challenges and what system you use to measure lead generation from content.